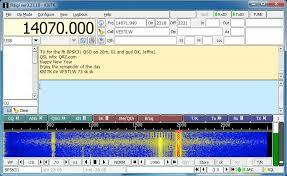 Again the Officers and Directors of Gulf Coast Amateur Radio Club appreciate your help and support. 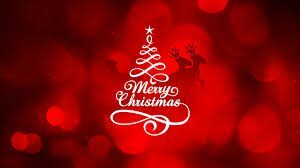 The Gulf Coast Amateur Radio Club Annual Christmas Party will be on December 10, 2017 at 1:00 pm. Club members are requested to bring a covered dish and notify Maureen KB2QNK at keavme@msn.com as to the number of people they are bring along with what dish. During the party the newly elected officers will be sworn in. The annual Christmas Party is always great. It allows us to reflect on our accomplishments for the year and give the newly elected officers our support and commitment. 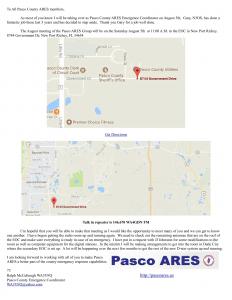 Gulf Coast Amateur Radio Club will be presenting a PSK Digital Mode class at the clubhouse on September 16, 2017 at 1:00 pm. Ralph McCullough WA3YFQ will be the instructor. IF you’ve been thinking about learning PSK this will be your opportunity. Please take action on this important item from ARRL – the National Association for Amateur Radio. The site will deliver your messages to your elected officials. 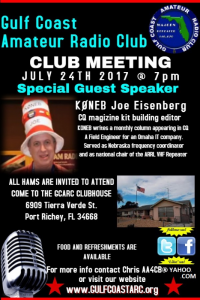 If you missed the meeting then you missed a special presentation by our special guest speaker “Joe Eisenberg K0NEB”. Everyone had a good time and the refreshments where great. 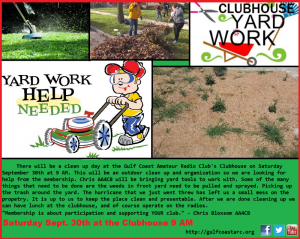 A special thanks to all that worked on preparing the clubhouse for this momentous occasion! Listed is the YouTube link for the meeting and presentation: https://youtu.be/Gf9sRXfbJJE Enjoy! 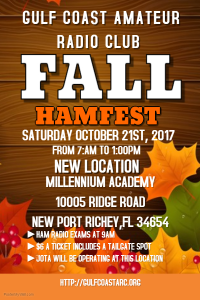 Come join Gulf Coast Amateur Radio Club make history with our first ever Fall Hamfest. Now enjoy our Hamfests in the Spring and Fall.